Tactile Ground Surface Indicators (TGSI) allow safe access to buildings and public areas for people with disabilities.These textured ground surface indicators are used on footpaths, stairs, ramps and train station platforms to assist pedestrians who are visually impaired. 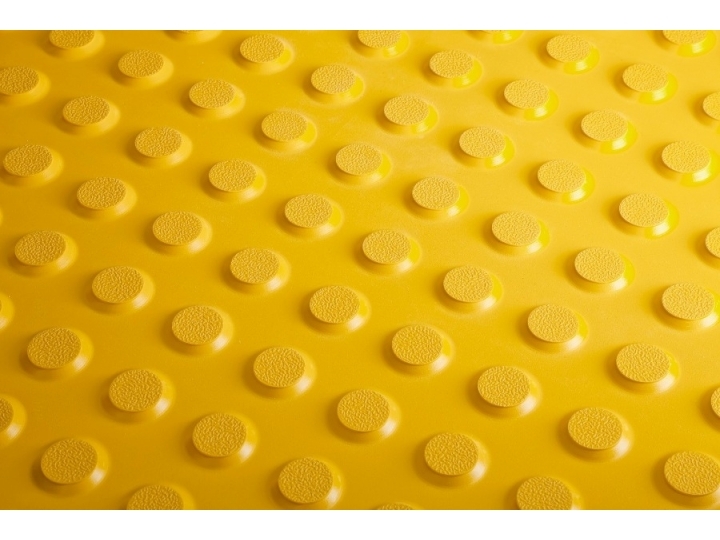 Grip Guard CobbleTac® Tactiles provide safe and effective tactile cues for the vision impaired. They are manufactured using tough porcelain to provide a cost competitive permanent solution and are warranted against manufacturing faults for a period of 10 years when installed to the manufacturer’s installation instructions. Grip Guard SureSteel®, discrete architectural stainless steel Tactile indicators are designed for installation in aesthetically sensitive applications or where exotic substrates are used such as polished timber, marble, granite, and the like. SureSteel® is manufactured from one solid piece of 316 stainless steel so the Tactile head will never detach from the anchoring spigot. Grip Guard PolyStud®, discrete architectural plastic Tactile indicators are designed for installation in aesthetically sensitive applications or where exotic substrates are used such as polished timber, marble, granite, and the like. PolyStud® is engineered and purpose built tough to withstand extreme point loading and side impact. The unique formulation and large anchoring spigot not only ensure the product is made to last, it also protects the substrate from any possibility of damage. PolyStud® is long lasting & resistant to heavy traffic abuse and maintenance machinery. New, unique 600x900mm format makes Grip Guard PolyPad® Tactile seamless. They are designed to retro-fit over almost any substrate and provide installers and building owners with the most simple and effective installation system. Less joins also ensures less dirt ingress and reduces the possibility of failure. Also available 300 x 300 peel and stick suitable for internal application onto vinyl, timber and other smooth surfaces.